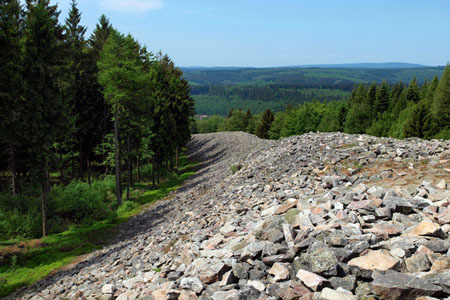 The name "Hunnenring" (=Hunnic ring) was falsely given to the ring wall on the Dollberg (620m) near Otzenhausen, which was actually constructed by the Celts of the Latène Age (475 to 20 B.C.). The walled area is large; the main wall is a remarkable long 1,360 metres, with a further 850 metres for the wall in front. More than 200,000 cubic metres of quarry stone were used in the grounds, which, with dimensions of 647 m by 460 m, comprises an area of almost 19 hectares. The dimensions are truly impressive: to the north the main wall is still 10 metres high with a base 40 metres thick. One must remember that the quarry stones were once held together between a framework of timber poles creating vertical walls that protected this urban settlement (Roman "Oppidum") of Treverians from invaders. It is estimated that the northern wall was 25m tall. The entrance was through the 6m wide west door, which was divided by a central post into two identically sized entryways and was apparently covered by a well-fortified wooden structure. In addition, protective walls on either side added to the defences. The grounds with the ring wall, still formidable in their dimensions, were constructed in the first century B.C., that is in the late Latène Age. There was probably a pre-existing fortress on the same location during the early Latène Age (fifth century B.C.). Proof of this is in the richly equipped princely tombs from this era, which were discovered in 1848 in Schwarzenbach, a village at the foot of Dollberg. In fact, princely tombs and graves from the early Latène Age were always within view of "their" fortress. The construction of these extensive grounds and the engineering of a simply designed rampart in front of the main ring wall allows us to imagine a steadily growing, fortified settlement where people in the surrounding areas could bring their livestock to safety in times of crisis. The well used for water supply still exists in the inner area. It gave enough water to assure that even longer sieges could be withstood. There is also evidence of a storehouse. It is assumed that the fortress on Dollberg was the ancestral seat of an ancient Celtic dynasty and was probably the centre of power for the Treverians in this region. We are told in Julius Caesar's accounts of the "Gallic Wars" [Liber V, 1-6] that it was the Celtic prince Indutiomarus who, in the year 80 B.C., began building the fortress area on Dollberg. This was originally planned as protection from the Germanic tribes (Cimbri, Teutons, Suebs and Alemanni), but soon became the focus of resistance to the Romans in a coalition with two other tribes of Treverians (the Latin name "Treverians" arose from this threefold coalition, "tre" meaning three). The battles with Caesar ended with the defeat of the Celts and the death of Indutiomarus in the year 54 B.C. That same year, the family of Indutiomarus left the fortress on Dollberg. Afterwards, the fortress remained uninhabited and gradually became dilapidated. A small, solitary temple from the 2nd century B.C. leads one to assume that Dollberg was also used in Roman times as a shrine, but one without any great significance. Similar places, but of much smaller dimensions, can be found at the Ringskopf, at the Alteburg, and at the Wildenburger Kopf near Kempfeld. An even bigger urban settlement of this sort is located on the Donnersberg (687m) in Palatinate. Here there used to be a Celtic fortification of the Latène-Age, enclosed by an 8.5km long ring wall system including animal pastures. With 240 hectares of floor space and an area of 1700m by 1400m this year-round inhabited settlement was the third biggest Oppidum in the whole of Middle Europe. It is worth including a visit to the "Hunnenring" and making a round trip. For instance from Züsch, a small village Northeast of the Dollberg, as your starting point you could hike to the ring wall system, and return via the Primstal reservoir. Its shores lead you comfortably back to the starting point (Drinking water supply! Swimming prohibited! ).